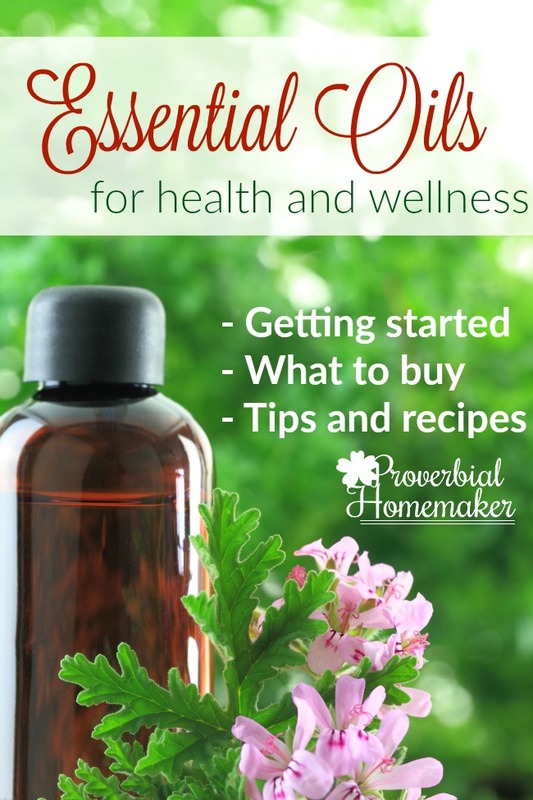 Have you been feeling like a weary and overwhelmed mom? It is easy to get to that place. We juggle all the responsibilities of the day, cook meals, wipe messes, tend to hearts and minds. At the end of the day we have very little left for ourselves and just a few hours before the next day comes with all its demands. I hear your sigh… or maybe that was mine. We need Jesus. Only He can come sweetly in these moments and lift our burdens, wipe up our heart messes, and tend to our souls. Only the Lord can give us the strength and courage to continue running the race and serving our families joyfully. We are not enough, in and of ourselves. We need the equipping and empowering of the Holy Spirit to do this work before us because – and this is important – what we are doing is critical t0 the Kingdom of God! He cares about it, He cares about us, and He wants to be our focus in everything we do as moms, wives, teachers, leaders, lovers, and friends. 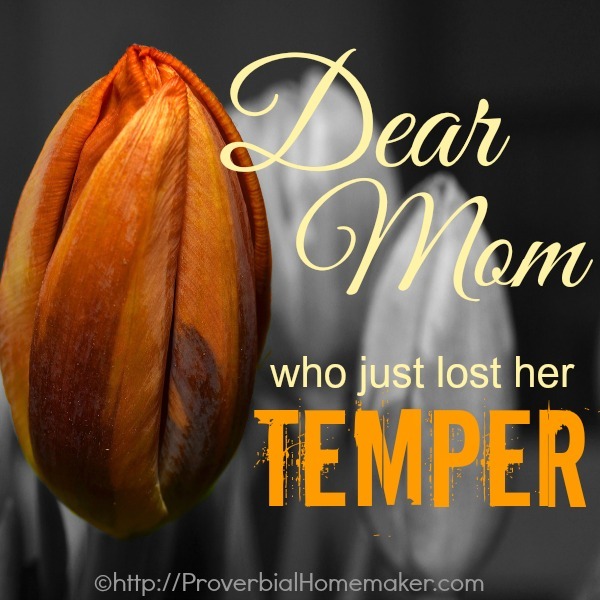 I love my calling as a mom, wife, and homemaker. I take great joy in it! However, I need daily (sometimes hourly) reminders to lift up my chin and fix my eyes on the King. You do, too, friend! Let us turn to the Lord together, drinking in His Word and allowing it to transform our hearts and minds. Lets square our shoulders and let the love and mercy of God wash over us, giving us fresh perspective and passion. 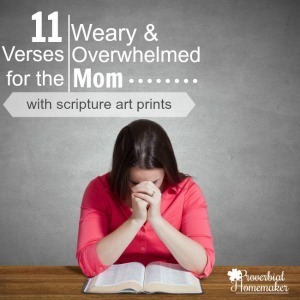 Here are 20 scriptures (ESV) that you can meditate on and pray over when you feel like a weary and overwhelmed mom. I encourage you to choose a handful to memorize. You can download the first four as beautiful scripture art prints (in ESV and KJV) to put up on your wall or tuck into your journal. I hope they bless you! 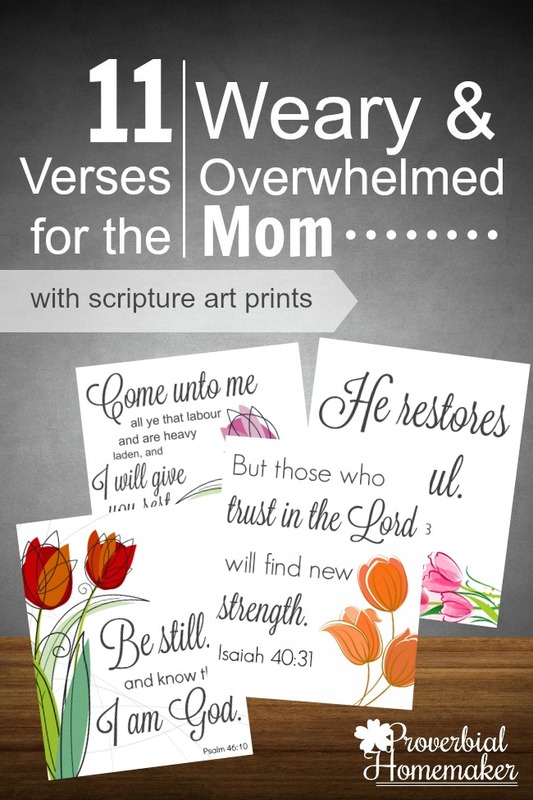 Download the Scripture Art Prints! 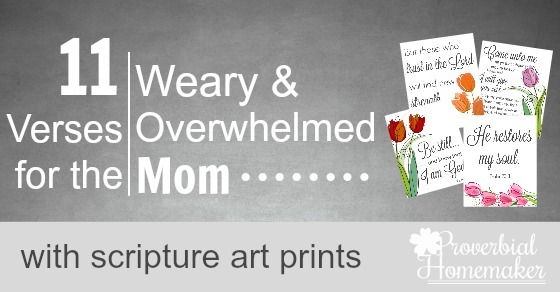 How do you download the Scripture for the Overwhelmed Mom printables? There is nothing to click on. You should see a download form where you can enter your email and name, and it will send you the download link. It’s right above the “You Might Also Like…” section. 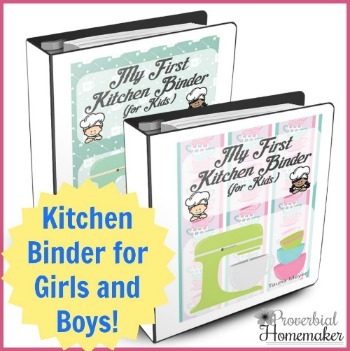 If you cannot see it for some reason, please email me at tauna(at)proverbialhomemaker(dot)com. Thanks! The secure download manager ran into a problem that it couldn’t handle, and is unable to process your download request. Please contact the site administrator. 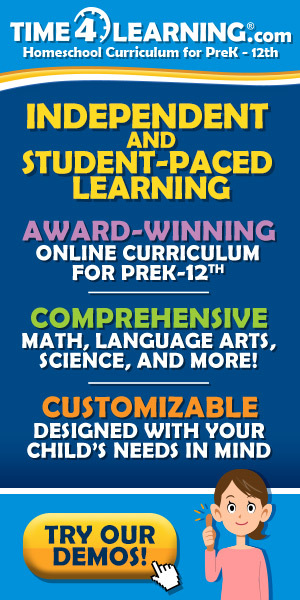 How do we download a freebie, if we are already registered on your page? I have a verse that helps me when I feel overwhelmed as I try to keep up with all the laundry, cleaning, dishwashing etc. It’s Proverbs 14:4 “Where no oxen are, the crib is clean: but much increase, is by the strength of the ox.” It helps keep the proper perspective.